Shear Diamonds Ltd. (TSX VENTURE:SRM) today announced the commencement of its spring drilling program at its 100% owned Jericho Diamond Project, Nunavut. The first drill hole within the Jericho open pit into the Jericho Kimberlite Complex has been completed and intersected more kimberlite than expected based on the past models..
As part of the ongoing exploration program (see news release February 28, 2011), a series of six angled delineation drill holes have been planned to test areas of the Jericho Kimberlite Complex where it is felt that additional data points are required and to determine the potential for increased tonnage. 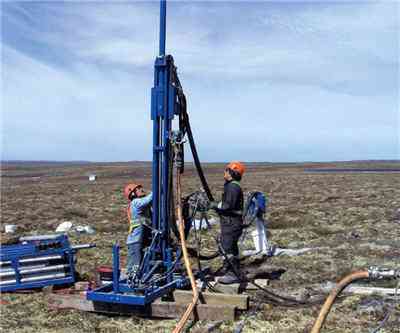 The first drill hole (11JER-01) was drilled from the 450 metre bench into the southern lobe reaching a final depth of 244.5 metres at a -65°inclination. The kimberlite contact was intercepted 27 metres before expected (according to the existing geological model), effectively increasing the outer contact by 10 metres in the horizontal plane. Drilling is underway on the 2nd hole from the ice surface at the bottom of the open pit to test a contact in the Central Lobe on the west side of the kimberlite. "The goal for 2011 is to refine and augment the existing geological model for the Jericho Kimberlite Complex as well as discover new kimberlites nearby," said Pamela Strand, President and CEO of Shear. "The results from our first hole are extremely encouraging. Obtaining this new information from the delineation program will increase Shear's confidence in the ongoing evaluation work on the Jericho Kimberlite Complex." Once the delineation drilling is complete and the final water licence is issued, the drill will be moved to the surrounding claims referred to as the Carat Property to test priority exploration targets suggestive of kimberlite based on ground magnetic and horizontal loop electromagnetic ("HLEM") surveys currently underway. To date, there have been a total of 296 line-kilometres of magnetic surveys over 27 targets, and 60 line-kilometres of HLEM surveys over 11 targets. Drill target selection is ongoing, with lake-based targets a priority for the remainder of the spring season. During the first quarter of 2011, crews worked diligently to open the Jericho Diamond camp. This included significant work on heating the site, getting the water treatment and sewage plant working, and ensuring that all facilities at site were in good working condition. At this time the camp is fully functional: it is fully heated, there is potable running water throughout, and the kitchen is in good working order. In order to conserve fuel, and to maximize the use of the facility, portions of the facilities were segregated to hold Shear's current crew that will host between 20 and 50 staff on site. The airstrip and all mine roads are plowed regularly and four Hercules aircraft have landed bringing in site supplies, equipment and the core drill. Additional activities at site include sampling for the Aquatics Effects Monitoring Program, commencement of ground geophysical surveying, site surveying, and community consultations. Shear is a Canadian-based company focused on diamond exploration and development in Canada's North, where it explores established diamond districts and has discovered new ones. Shear currently has a portfolio of eight diamond projects, including three advanced projects with development potential. Shear holds a 100% interest in its recently acquired Jericho Diamond Mine and surrounding exploration assets, located in the Kitikmeot region of Nunavut. Read the full news release here. Photo from Shear Minerals annual report.